There are so many issues that draw public and artist attention: climate change, missing and murdered women, racial inequality, child abuse, animal abuse, environmental disasters, poverty and homelessness, etc. The abhorrent treatment of food animals on raised on factory farms to meet the rapidly increasing demand for meat, poultry, fish, dairy and eggs, was one issue I felt was not being addressed. I have been sensitive to eating meat from early days. I had often threatened vegetarianism but our family opted for going free-range and supporting small local farmers who were trying to treat animals respectfully. For my intervention, I decided there was enough horrible material out there. I needed to do something different – to start a conversation, get people thinking about where their food comes from and changing the way they shop and eat. After a number of false starts I came up with the idea of doing Anne Geddes-style babies in flowers, substituting a piglet for an infant. 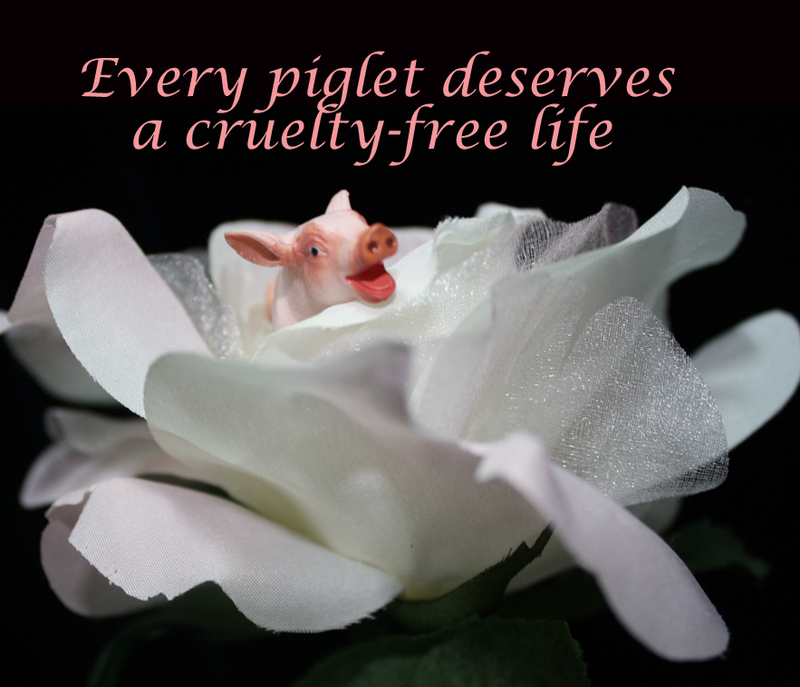 I proposed that every baby – and that included baby farm animals — deserved a cruelty-free life. I fashioned my photos of a plastic piglet in a rose into lapel pins which were distributed around the Rideau Centre in store windows and displays and subsequently given as gifts. I don’t know if the pins have affected any change but I finally felt empowered using my art for social change.